Dietitians are often taken aback by new fad diets or miracle foods being pushed by the media. Here are some of the top dietary myths that seem to get a large amount of media play time. Clean eating is getting its fair share of attention in the media, Face book, Twitter and Instagram at the moment. Pictures of ‘clean meals’ and ‘clean bodies’ are everywhere, but what exactly does this all mean, and is it healthy? Mindfulness allows one to be present, self aware and appreciate moments. One benefit of mindfulness is that it can make us more aware of unhealthy diet and lifestyle patterns and act in a healthy conscious way to change. Healthy Takeaway - Is that an Option? When food is not prepared by us we have no idea how much added salt, sugar and fat are included and no control over portion size. What we can control is our choice! Here are some quick tips to healthier choices if eating out is the only option, or you just want someone else to cook! Findings show that the more time spent on Face book, the more likely one is to compare themselves to others, leading to a negative self image. So how can you make your Facebook page make you feel better about yourself? This new Google search addition makes comparing the nutrition content of foods so easy! Do Our Cravings Highlight Our Nutrient Needs? Many people believe that particular cravings may be a sign of a nutrient deficiency or needs in the body. This is totally fiction. Our cravings tend to have more to do with our emotional needs and desires and less to do with what our body actually requires. Easter does not have to be all about chocolate. Use this holiday weekend to cook and bake and enjoy some healthier delights! Could it possibly be one food that is to blame for all the excess kilos our population is carrying around? We at Perth Diet Clinic have looked at both sides of the argument in two previous articles about super foods. This article discusses the most recent foods to earn the ´super foods´ title. Part two of the highly controversial ABC program Catalyst not only questions the ability of statins to lower cholesterol, but also the motivation behind the extent to which they are prescribed. The ABC program Catalyst ran a controversial series questioning the link between saturated fat, cholesterol and heart disease. Here we look at the argument in detail. What is a Healthy Carbohydrate? With all the hype surrounding low carbohydrate diets, it is no wonder that many people have become confused as to whether carbohydrates are indeed healthy or not. Here we take a good look at the facts. Geneticists believe that damage to an individual’s DNA is ultimately what leads to rapid ageing and an increased risk of disease, and that this DNA damage is largely caused by what we eat. Can Coffee Help to Cut Weight? For a beverage that is consumed in such large amounts around the world, it is a wonder that more conclusive research has not been completed to give us the absolute pros and cons of coffee drinking. Coffee is always in and out of the media spotlight for one reason or another. For a beverage that is consumed in such large amounts around the world, it is a wonder that more conclusive research has not been completed to give us the absolute pros and cons of coffee drinking. This is a follow up to our previous Superfoods article, looking at more scientific reasons to question their validity. A curry is a great winter meal that can be packed full of a variety of vegetables and lean meats. It is important to remember that once the baby is born and the Gestational Diabetes is essentially over, there is still an increased risk of developing Type 2 Diabetes. It is important to continue a healthy diet. Which Soup Should You Warm up with this Winter? Unfortunately we don’t always have time to make our own homemade soups, but luckily there is a huge variety of soups available in the supermarket. If you choose wisely, they are generally low in kilojoules, low in fat and contain a variety of vegetables and fibre sources. What’s so Super about Super-foods? Technically speaking, a super-food is one which provides an additional benefit beyond that of its regular nutritional functions. However, scientifically speaking, there are yet no regulations placed on ‘who can call what’ a super-food so there is no regulation to ensure these foods are actually providing any additional benefits. Lately researchers have been questioning the validity of a number of studies and health benefit claims and are asking whether fish oil supplements offer the same benefits as omega-3 from food sources. The latest in detox diets is receiving major media hype, but what are the facts? In December 2002, a food standards code was brought in to make it mandatory for most food labels to carry specific nutrient information. There are some exceptions such as food sold in small packages, food packaged in the presence of the purchaser, coffee and alcoholic beverages. Trained health professionals such as Dietitians are often taken aback by new fad diets or miracle foods being pushed by the media. Here are some of the top dietary myths that seem to get a large amount of media play time. A cheap and easy appliance that cooks healthy meals with very little hands on time. Research suggests diet plays a role in migraine sufferers. It is linked to foods causing overstimulation of the arteries in the head, leading to pain. Fat is essential to good health, however too much of it can give rise to a number of health problems. Here are some tips on reducing fat in your diet. We all know that high cholesterol is not good for health. No doubt you have read many articles on increasing fibre and lowering saturated fat, but have you ever heard of beta-glucans? Plant Sterols – Are the benefits worth the cost? We know plant sterols are good for us, but is it worth adding the expensive plant sterol enriched productsa to your supermarket trolley? What do You Gain from a Fad Diet? They say fad diets help you lose weight, but do they ultimately lead you to gain more than you lose? If you are not following a healthy and varied diet, you may be at risk of protein deficiency. So what is protein, and why is it so important? The number of functional food products available on Australian supermarkets has grown considerably in the past few years, and the food groups included has broadened. So what is a functional food, and what benefit is it to you and your family? Is there a Place for Sugar in a Healthy Diet? Sugar can be found in many of the foods we eat, including healthy and not so healthy foods. It would be impossible to remove all the sugar from your diet and still maintain healthy variety, but there are definitely some sugar containing foods that are better choices than others. Your Dietitian can help you work out which fibre additive is best for your individual condition, and how much and how often you should take it. If you have a problem with constipation, you should always consult a dietitian regarding diet, fluid and exercise before contemplating any other remedy. As we enter 2010, Australia's major health issues continue to be obesity, type 2 Diabetes, heart disease and cancer. The number of people diagnosed with metabolic syndrome continues to rise, and the number of obese children has sky rocketed. These issues are mostly related to over eating and lack of physical activity. Does Alcohol have a place in a Healthy Diet? Alcohol consumed in small quantities has been shown to be beneficial to the health, however it can also be the cause of some major health problems when it is consumed in larger quantities. Parents, although concern for their children health, may not give the best advice or convey positive messages for weight problems. A well balanced diet and regular physical activity are important for your daily well being and for the prevention of lifestyle diseases (eg obesity, hypertension, heart disease, stroke, diabetes, cancer, eating disorders). What are the dietary guidelines for healthy eating? Are your eating habits keeping you healthy? We looked at a number of vegetarian diets and examined the additional nutritional requirements of vegetarian diets. In a time of plenty when obesity is more the norm then a rarity, diets may be nutritionally inadequate. Women often have insufficient intake of calcium, zinc, iron, folate, fibre, antioxidants and water. They can also be inactive. Here are some great links that can help you on your way to eating healthier and exercising more regularly. The Australian Guide to Healthy Eating is a publication of the Population Health Division, Commonwealth Department of Health and Ageing. It is a contemporary Australian food guide which reflects the multicultural nature of the population and which is relevant for all sectors of the food system to use as a national nutrition education and information tool. 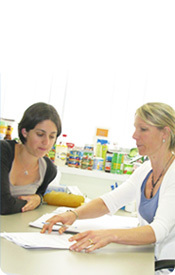 The Guide is based on widely accepted scientific principles and has been informed by the Dietary guidelines for Australians and the Recommended dietary intakes for use in Australia. People are often more caring of their car, dog or home than their own body. Correct eating habits now to help prevent disease rather than wait to use pills and surgery when a real problem occurs. Maintain a healthy weight, be active and eat well to protect your body in the future. Many people take the blind-fold approach to type 2 diabetes, heart disease, high blood pressure and cancer. Water is essential to life. It is better to avoid dehydration than try to make up for it later. A well balanced diet and regular physical activity are important for your daily well being and for the prevention of lifestyle diseases such as obesity, hypertension, heart disease, stroke, diabetes, cancer, eating disorders.